A local bail bondswoman was acquitted recently on charges she misappropriated money from a client, but her husband will face a jury next week for the same case. Dameisha Moore, 42, was cleared last week of accusations she failed to return $65,000 held as collateral on an appeal bond. “The truth came out,” said Moore, who founded Moore Bail Bonds in the 1990s. The money was deposited into the company’s account in 2010 and then removed, according to a release from her attorney, Norman Pattis. In 2014, the client requested the collateral after losing an appeal. The state had accused Moore of removing the money for personal use, rather than holding it in a trust, Pattis said. She was charged with larceny, failure to return collateral and operating as a surety bond agent without a license. “The State of Connecticut is overreaching in this case,” Pattis said in a release. The prosecutor could not be reached for comment. Michael Baptiste, Moore’s husband and the company’s surety bail bond agent at the time, has pleaded not guilty to larceny and conspiracy to commit larceny in the case. He will appear in court Feb. 5. John T. Walkley, Baptiste’s attorney, said it remains to be seen how Moore’s acquittal will affect Baptiste’s case. As a witness in Moore’s case, Walkley was sequestered during the trial and did not get to see what happened in court, he said. Walkley said he requested the transcripts from the trial to help him with Baptiste’s case. “We’ll see what hopefully will be there to benefit (Baptiste),” he said. Moore has not had a bail bond license since 2004, but she said she is not sure whether she will try to get the license back because she is still fighting other charges. In separate cases, Moore is due in court Feb. 26 on larceny and other charges from 2010, 2011 and 2012. She has pleaded not guilty to these charges. She also has previously been convicted of larceny. Yvonne Perkins now runs Moore’s company. 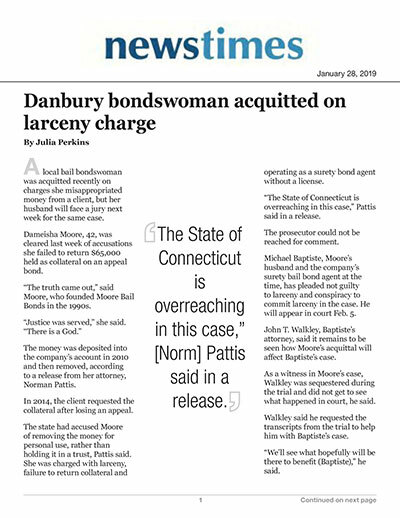 Perkins filed a federal suit against the Danbury police department, accusing officers of conspiring to put the company out of business by steering clients to competitors. The suit also claims the department conducted illegal searches and illegally recorded telephone conversations. The city declined to comment on the suit when it was filed in July.